The Unmasked Persona's Reviews: The Anti-Langdon Thriller "Hero"
If The Pelican Code by Tim Lea really was intended to be a conventional thriller, it doesn't succeed very well. When I reviewed it for The Bookplex, it appeared to be a different sort of book entirely. Below is my review. A thriller is expected to deliver exciting action sequences throughout the novel. 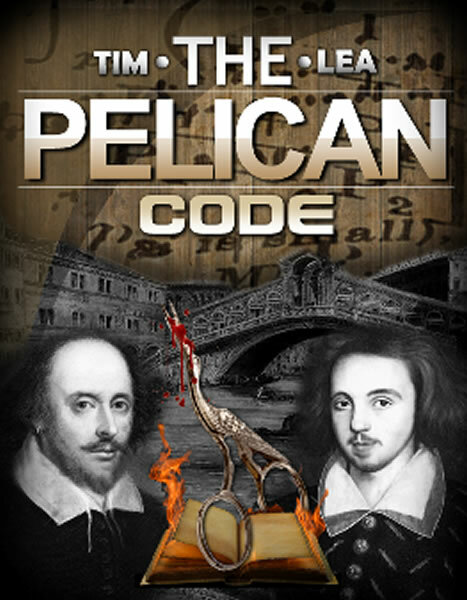 In The Pelican Code there was no contemporary thriller type action until the second half of the narrative. What do we get in the first half? There are historical flashbacks to the Elizabethan period. These are very appealing to readers who enjoy historical content. The contemporary sequences weren’t quite so interesting to me. We find out a great deal about the personal lives of the protagonist and antagonist which didn’t seem very relevant to the plot. In retrospect, I can now see what Tim Lea was trying to achieve through this personal focus. The author invests a great deal of space in humanizing the central character, Toby Malone. I couldn’t help comparing him to Dan Brown’s academic thriller hero, Langdon. Langdon comes from the same tradition as James Bond. He is always well-dressed and suave. The moment I saw the passage about Malone wearing rumpled suits, I realized that Tim Lea was setting him up as the anti-Langdon. Readers who want to see more realism in their central characters will appreciate that, but the character Malone had larger aspirations. Malone’s hero, Christopher Marlowe, might have been an Elizabethan version of James Bond himself. It is thought that he engaged in espionage. There is only a brief reference to Marlowe being engaged in secret work for England’s interests in The Pelican Code. I would have liked to have seen something of Marlowe as a spy in a flashback since this is a thriller. Certainly Marlowe’s life was a great deal more interesting than Malone’s. Some characters considered Malone’s identification with Marlowe pathetic. Identifying with an admired historical personage isn’t contemptible. It’s wonderful to have a source of inspiration. Unfortunately, Malone’s relationship to Marlowe is obsessive which presents problems for him in his personal life. In current parlance he could be considered a “fanboy”. I think that Tim Lea is dealing with the issues raised by the fan phenomenon. Is it worthy of respect? Can someone like Toby Malone put being a fan of Christopher Marlowe in perspective? Malone believes in the theory that Marlowe wrote the works of Shakespeare. I don’t find this theory credible, but I was willing to go along for the ride. The Pelican Code asks interesting questions. Readers will be intrigued. My problem is that in an alternate universe where Marlowe wrote Shakespeare’s plays, they would probably be read and staged as frequently as the plays that are credited to Marlowe. This is to say that they wouldn’t have such a central position in the literary canon. I think that one of the reasons why generation after generation responds to what Shakespeare wrote is precisely because he wasn’t university educated. He had a better understanding of the common folk and their concerns. He drew on folk traditions that university educated men like Marlowe would have considered base superstition. He included what was considered low comedy in many of his most successful plays. Marlowe would probably have called that pandering to what were then called “the groundlings”. Marlowe was an intellectual writer who dealt with important themes. Shakespeare wanted to entertain first and foremost. Yet by trying to please his audience he created so many memorable characters. Reflecting the soul of humanity was Shakespeare’s theme, and that’s why his work lives on in the popular imagination while Marlowe’s work is mainly known to scholars. I want to address the issue of Shakespeare's education. He was actually much better educated than many contemporary Americans. At the Stratford grammar school that he would have attended, he would have studied classical Latin works. See http://www.shakespeare-online.com/biography/shakespeareeducation.html for a detailed discussion. If so, she could be the source of all of Shakespeare's information about Italy. It seems to me that Malone and other advocates of the theory that Christopher Marlowe wrote the works of Shakespeare need to be better informed about both Marlowe and Shakespeare. Good defense of WS. I fully agree! Can Celtic Historical Romance Be Authentic?